This calculator will calculate the internal rate of return (IRR) on an investment where deposits and withdrawals occur at irregular intervals. The calculator will perform up to 100,000 iterations in order to find a rate that will solve for the schedule of deposits and payments. Also includes a printable chart showing the future value of each cash flow at the calculated rate. To add a cash flow, Enter/select the date, amount, and direction and then tap the &plus; button (may also appear as "Add" or "Add Cash Flow" depending on the width of your device). To edit a cash flow, tap the radio button in the Edit column. This will load the cash flow into the form for editing. When you're satisfied with the changes you've made, tap the S button (may also appear as "Save" or "Save Changes" depending on the width of your device). To delete a cash flow from the list, tap the radio button in the Edit column. This will load the cash flow into the form for deleting. Tap the − button (may also appear as "Delete" depending on the width of your device). To clear the form to create a new cash flow, tap the C button (may also appear as "Clr" or "Clear" depending on the width of your device). Important! The entered cash flows are saved in your device's random memory (temporary storage), which means that if you surf to another calculator or close this browser window you will need to re-enter your cash flows. Select the applicable month and day and enter the 4-digit year of the date the cash flow occurred on. You can enter the cash flows in any order as the calculator will sort the list of cash flows by date, from oldest to newest, and will assume the oldest was the initial investment. Enter the amount of the cash flow. Enter as a positive dollar amount, but without the dollar sign and any commas. Use the next line to indicate whether or not the cash flow was an outflow (investment) or an inflow (return). Select the cash flow direction. Select "Out" if the cash flow was an investment or expense. Select "In" if the cash flow was a receipt, as in a dividend or withdrawal. The is the sum of all withdrawals and the ending value minus the sum of all invested amounts. This is the total number of entered cash flows that were included in the calculations. This is the number of days between the date of the beginning value and the date of the ending value. The closer this result is to zero, the more accurate the Internal Rate of Return result. This is the number of secondary iterations (tries) it took to find a rate of return that would support the entered schedule of investments and withdrawals. If this result is equal to 100,000 it means the XIRR Calculator reached its limit of tries before finding a solution within +/- $0.05 of a zero balance. This is the estimated average annual rate of return of the entered cash flows. Do you have an investment that has the following characteristics? If you do, my next question is, do you know how to determine the average annual return on your investment so you can compare the rate of return to other investments? If you answered, "yes, by using the XIRR Function in a spreadsheet", then to you I say congratulations! On the other hand, if the mere thought of trying to determine the rate of return on this type of an investment gives you an instant headache, then you're going to love the calculator on this page. Simply enter the date and amount of the initial investment, then the dates and amounts of all subsequent investments and withdrawals, then click the "Calculate XIRR" button. 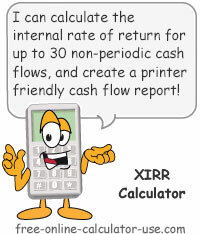 The XIRR Calculator uses a trial and error method of determining the rate of return for a non-periodic schedule of investments and withdrawals -- which is similar to the XIRR function used in spreadsheet applications such as Excel™, OpenOffice Calc, GoogleDocs, etc. Specifically, this calculator begins by assuming the annual rate of return is -100%, and then increases the rate of return by 1% until the combined future value of the cash flows is greater than zero. From there the calculator keeps subtracting .0001% from the "guess" until the combined cash flows is within +/- $0.50 of zero. Each time the calculator adjusts the guess and recalculates the combined future values of all cash flows, this is referred to as one iteration or one try. Believe it or not, the calculator will perform up to 100,000 of these iterations before it stops trying to find an acceptable solution. Plus, unlike other online XIRR calculators, this calculator will even display a printable chart showing the future value of each cash flow -- which will help confirm or deny the validity of the calculated internal rate of return. Finally, if you're not sure what is meant by "Internal Rate of Return" (IRR), please visit the "Learn" tab on the IRR Calculator for an explanation. Select the month and day and enter the 4-digit year of the date of the cash flow. Enter the amount of the cash flow. Select the direction of the cash flow (Out for investments, In for withdrawals). Tap the Save (+) button to add the cash flow to the calculator. Once you are satisfied with your cash flow entries, tap the "Calculate XIRR" button. This will display the internal rate of return, along with a printable chart showing the future value of each cash flow.